Collins Booksellers - 2014 Food, Nutrition, and Wellness Events by Sandra Frank, Ed.D, RDN, LD, 9780991341405. Buy this book online. 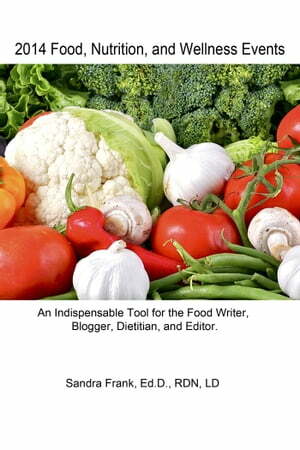 An indispensable tool for the food and/or health writer, blogger, dietitian, and editor. Each month highlights food, nutrition, and wellness events for the month, week, and day. Food photographs or graphic designs are provided to illustrate special events. In December books by dietitians are featured. The holidays and events listed come from numerous resources, such as: United States Department of Agriculture, Food and Drug Administration, Presidential Declaration, Federal, State or City Governments, Academy of Nutrition and Dietetics; Food Associations, American Medical Association, Medical Affiliations; Private Organizations and Companies, Retail Promotions. The events have been verified. However, you should confirm the dates before making plans. Some events may vary from one state to another.